This past month I have prepared risotto three times; that’s 3 more times than I’ve made risotto the entire last year! I’m a huge fan of risotto but never find the urge to prepare it for myself. That is, until, I thought of a new way to prepare this Italian dish. Risotto is usually prepared with rice, white wine, and chicken stock, cheese and whatever protein and add-ins you desire. 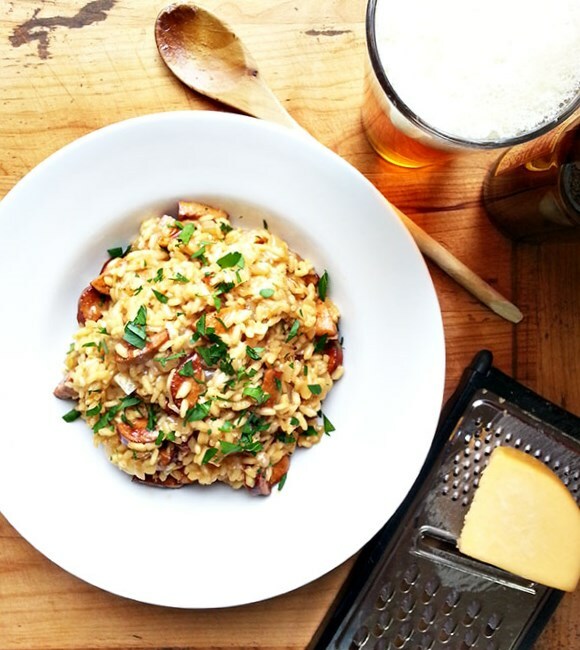 While watching a cooking episode about beer dishes, I thought, “why not prepare risotto with beer instead of the white wine?” A couple days later, I attempted the recipe and was pleasantly surprised with how delicious it came out to be! I present beer risotto with spicy sausage and gouda! Pour the chicken stock in a medium sauce pot. Keep warm over low heat. Heat 1 tbsp oil in large saute pan over medium heat. Add the sliced sausage and saute until browned, about 3 minutes. Remove with slotted spoon and set aside. Add chopped onion and garlic to the same pan. Saute until translucent, about 3-4 minutes. Add the rice and saute for 1-2 minutes or until there is a slightly nutty aroma. Add half of the beer and stir until it is fully absorbed. Add the remaining beer and stir until it is fully absorbed. Add a ladle of the chicken stock and cook until fully absorbed, stirring frequently. Continue adding the stock in increments once the rice appears almost dry. Cook until the rice appears creamy and is al dente, about 20-30 minutes total. Stir in 1 tbsp butter and the grated gouda cheese. Add back the sausages. Season risotto with salt and pepper. Garnish with chopped parsley and serve. If you ever watched Top Chef or Hell’s Kitchen, you will recognize that risotto is one of the most difficult dishes for chefs to accomplish. Risotto is an Italian dish made from short grain rice. It requires a slow cooking process to evenly cook the rice and can easily be under or over-cooked. Don’t let these qualities derail you from attempting to prepare this dish at home! If you take your time and follow my hints, your risotto will come out perfect every time. The first step, heat the chicken broth. Adding hot broth to the rice keeps a constant temperature, shortening the cooking process. When you’re ready to cook, use a heavy-bottomed saucepan or straight-sided saute pan to allow even cooking. 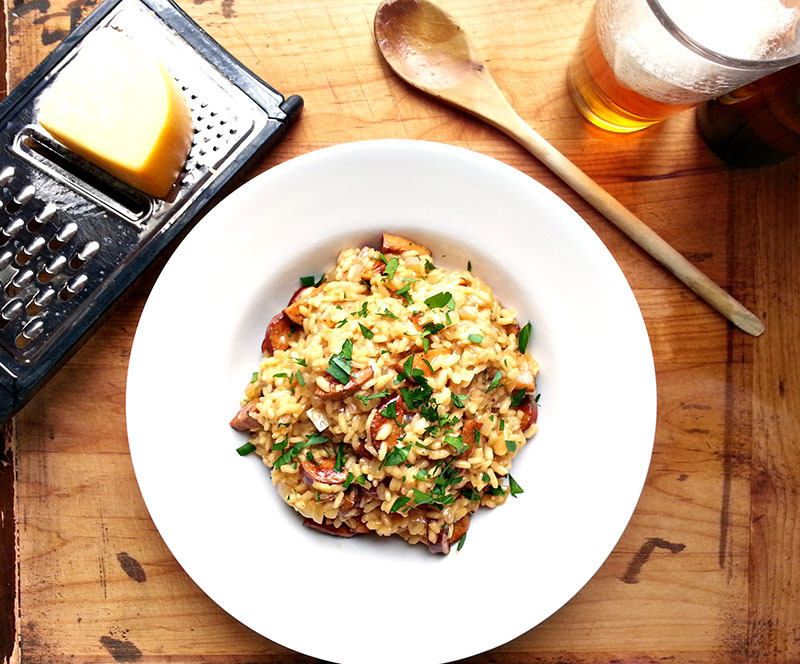 While cooking the risotto, use a wooden spoon to stir the rice. A wooden spoon is less likely to break the grains of the rice as opposed to a metal spoon. In most recipes, there is only about 1/4-1/2 cup white wine added to the risotto. For my beer risotto, I decided to increase the amount of beer and decrease the amount of stock. I wanted the flavor of the beer to be more prominent than the stock. Choose a dark beer to impart more flavor. The standard ratio of rice to liquid is 1 cup rice to 3-4 cups liquid. Adjust accordingly as you cook your rice. As the rice absorbs the liquid, it releases its starches and becomes creamy. The butter and cheese at the end help finish the dish. Be careful when seasoning with salt and pepper, keeping in mind that the sausage is already salty. You can use a spicy sausage as I did or use sweet Italian, Andouille, chicken apple, whatever you prefer. When I first took a bite out of the risotto, I was surprised at just how delicious it was. The smoky, spicy sausage cut the heaviness of the dish, while the rich, smooth gouda brought the entire dish together. The dark beer added a nutty element while the rice was perfect al dente. Wash it down with another glass of beer for a real treat! 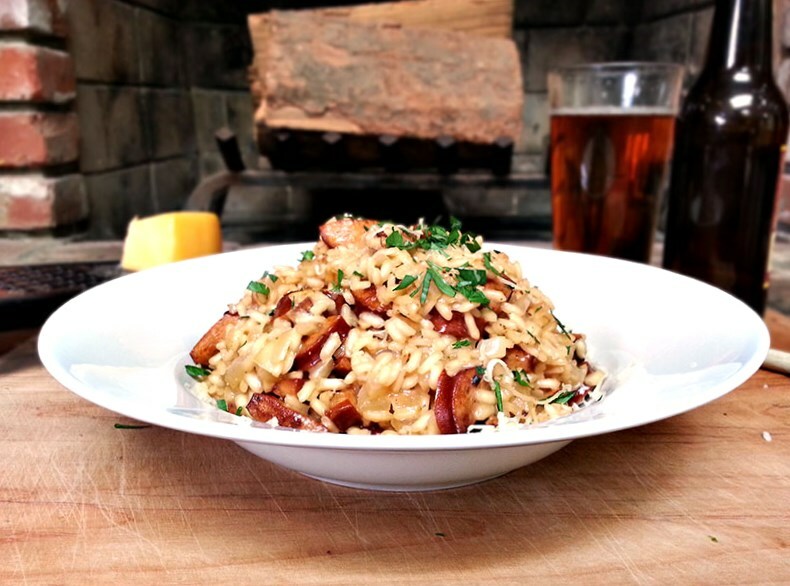 What a great idea to make risotto with beer. I NEVER would have come up with that one but I am thrilled that you did! 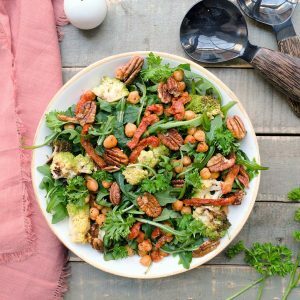 It's such a simple substitution but changes the entire dish completely! I LOVE this idea, it's so creative! Thank you! A simple substitution goes a long way! I attempted this recipe, i used kielbasa and smoked Gouda iand it taste delicious! Though the color came out more brown than the yellow yours appears to be, could that be because of the change in ingredients or was it something I might've done wrong when it came to sautéing? It could have been either the beer or if you toasted the risotto longer than I did. You might have just used a darker beer than I did, but I'm glad the dish came out well! When you say dark beer. Do you mean like Guinness or something lighter? Cooking this right now. If it's still under cooked, what do I do? Nevermind. I did it! Can you tell I was in a panic? It came out great! Sorry I didn't reply quicker. Glad it came out great! I am very much looking forward to trying this! But what sort of dishes would you pair with it? 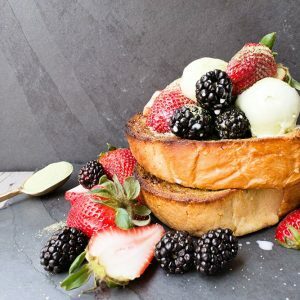 I don't mind having it as a the main dish, but what would some main dishes be that go well with it? Also, what are some sides for when I want it to be the main dish? I would pair it with a beef, pork or chicken dish rather than a seafood dish to withstand the heartiness of the risotto. For example, a roasted herb mustard pork loin would be a nice accompaniment along with a side salad and perhaps roasted vegetables. I am not really a fan of beer at all! if I were to just use chicken stock in place of the beer the recipe calls for do you think it would still taste good? It wouldn't be the same but it would still be delicious with the gouda and sausage. I say, give it a try anyways! when you say a spicy sausage, what did you use? Would one of those Mattesons sausages work? Yes the Mattesons sausages would work. You can really use any type of sausage but I like the spicy Italian sausage for this particular risotto since the spiciness helps cuts the dish. When you say dark beer, how dark? I used a porter and it came out bitter. What did you use? I edited the recipe to read "nutty, brown ale" rather than "dark beer" since too dark beers such as stouts and porters make the dish bitter. Some examples of beers that would work include Sam Adams Hazel Brown, Hawaii Nui Hapa Brown Ale, Chestnut Hill, etc. IPAs are much lighter but would also work. I made this recipe for dinner tonight and my boyfriend and I both loved it! I mean...beer and cheese...what's not to love? Thanks for the recipe! Right? You can never go wrong with beer and cheese! So glad you and your boyfriend enjoyed it! Hi- Thanks for the great recipe! After you add the last ladle of chicken stock, do you wait 20 - 30 minutes? Or is the whole process of adding chicken stock the 20 - 30 minutes that is referred to in the recipe to make it creamy? You're great! 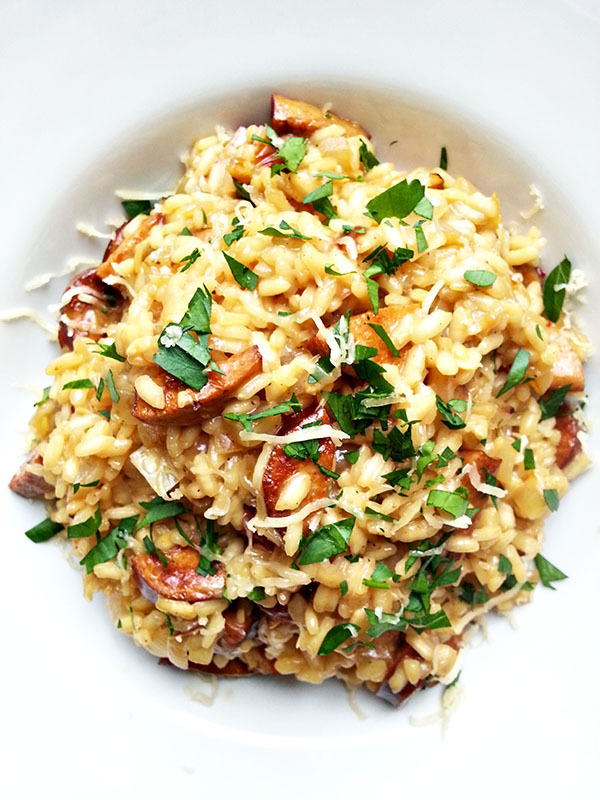 Risotto is such a great canvas for cooking arts. I'll try the beer route next tome. If you do the wine route I've found dry vermouth adds an interesting note. Vermouth would be a great alternative - thanks for the reminder!